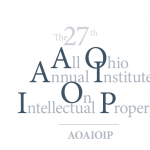 The 27th All Ohio Annual Institute on Intellectual Property (AOAIOIP) will be held in the Cincinnati area on Wednesday, September 13, 2017 at the Northern Kentucky Convention Center. CincyIP members who renewed their CincyIP membership by August 1, 2017 will receive a discount for AOAIOIP registration. CincyIP members who are not members of the Cincinnati Bar Association – you will need to register for AOAIOIP by mail, fax, or phone to receive the CincyIP Member discount for AOAIOIP registration. For more information on AOAIOIP, and to register, visit the CBA website.